Freshly-baked croissants and breads, made-to-order squeezed orange juice and our delicious Suzette's Blend Coffee from Intelligentsia…is there any better way to start the day than a Petit Déjeuner at Suzette's? Yes there is. 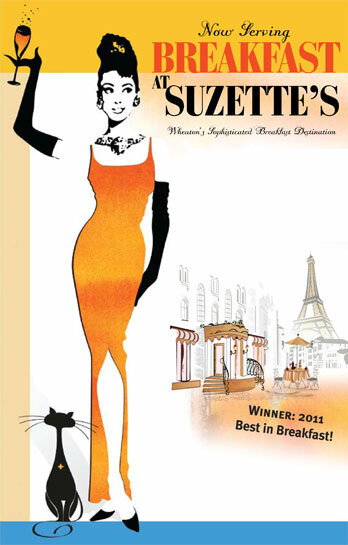 Breakfast at Suzette's. 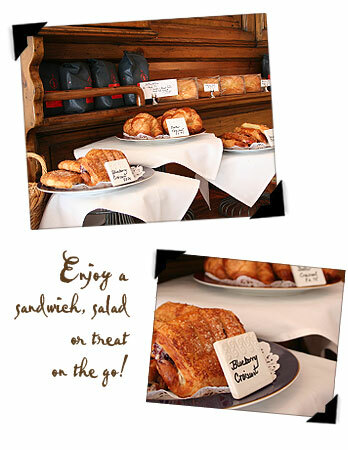 Now serving a full breakfast menu in a relaxed, sophisticated atmosphere. Suzette's is perfect for a business meeting, leisurely breakfast with friends or for those days you just want to feel like you are on vacation. All crepes and quiche are served with baby field greens and Suzette’s Balsamic Vinaigrette salad. Always good... imported Krakus Ham and Swiss Cheese grilled together in a crepe. Simple but delicious. 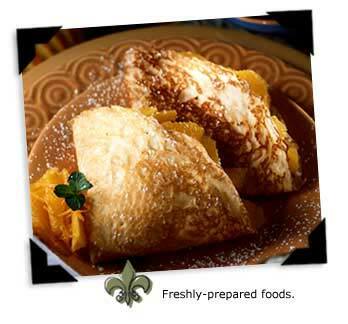 Spinach soufflé at its finest wrapped in a Suzette’s Crepe with Swiss Cheese. Chicken in creamed sherry sauce and mushrooms. Shrimp sautéed in butter with red, yellow and poblano peppers topped with coconut and lime. Made the authentic French way with a bottle of red wine and braised slowly for six hours. Fresh Salmon sautéed in butter, placed in a crepe & laced with Tarragon Creme sauce. Bacon with Swiss cheese, eggs and cream in a flaky pie crust. Broccoli and cheddar cheese mixed together with eggs and cream. A great vegetarian item. Quiche with tender, delicious spinach. Extensive selection of wine and spirits, see wine list page. 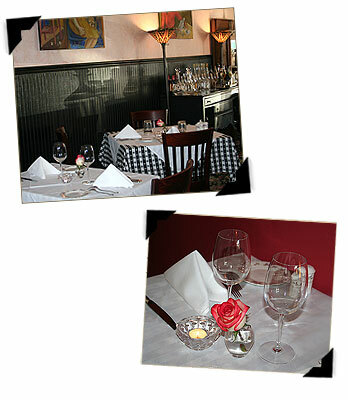 To make a reservation over the phone, or for further information, call 630.462.0898. ©2018 Suzette’s Creperie. All rights reserved. All information subject to change without notice.